From a design standpoint, it was beautiful. 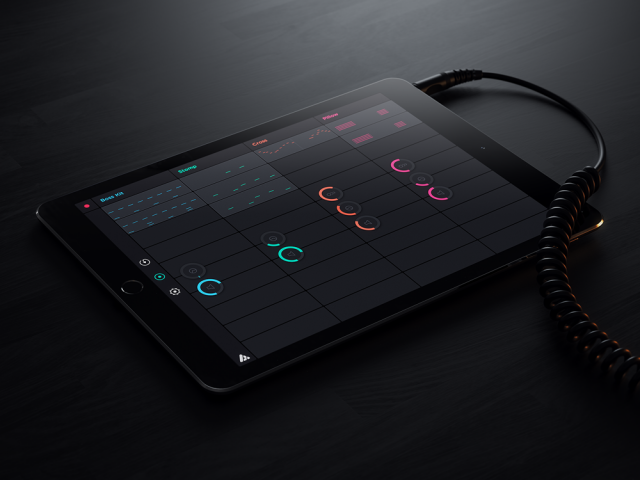 Auxy already demonstrated that a stripped-down app could provide an elegant way to simply produce musical patterns. Using a clean, piano roll-style graphical interface, it was finally a demonstration that you could make a music app for editing notes that felt native to a touch environment. There was just one problem, a big one: you were limited to the very basic built-in sounds. So, Auxy was a bit of a conundrum. It was the perfect app for making patterns for other apps and hardware, but it didn’t have the ability to connect to them. It seemed a perfect way to sketch musical patterns on the go, but it didn’t have MIDI export so you could use those sketches with other tools. An overly-simple island, it was something beautiful … that you might never use. That changes with the release this week of MIDI functionality. Now, Auxy is an island no more. First, you can use it to send MIDI. You can route patterns to other apps. Or, using a hardware interface, you can connect to outboard hardware. Seriously, as predicted, I haven’t felt the need to pick up Auxy since it came out. Now, I will. It’s a good thing they’ve added other features, too. Triplets and 1/32 notes are here, too, so Auxy progresses beyond the musical education level of a toddler (or, okay, some of us adults when we’re making techno – ahem). To celebrate the release, Auxy also have a video hands-on called “Auxy loves analog.” Swedish producer combines Auxy with a drool-worthy studio containing a Dave Smith Tempest drum machine, Moog Minimoog Voyager, Eurorack modular, and Virus Indigo. Now, by the time you’ve bought all that, you might wonder why you didn’t keep spending money on a hardware sequencer. On the other hand, the mobility of the iPad makes it perfectly suited to doing this sort of hardware sequencing elsewhere – for those of us who can’t afford an extra rack of sequencing gear. Looks great. Of course, now that we’re using Auxy, we’ll probably find other stuff for them to add, but I say bring it on. And, this isn’t the only MIDI iPad… ahem. Sorry. Separate story. Bottom line: Auxy without MIDI was a pretty example of good design. Auxy with MIDI is a must-have. And it could change the way you work on the go. MIDI functionality is a US$8 in-app purchase. But I’ll defend this model: it means you can try the app itself for free to see if you like it, then invest roughly the cost of what a standalone app might be.